Frequency: 30 kHz Search Head: 100x190 mm Tuning: Autotune Alarm on Detection: Audio/Visual Indicators: Unit on, Low Battery Power: Dry Battery Detection Capability: Pistol 15 cm, 1 Rupee Coin 2-3 cm. 3-Detects metals like gun, pistol, knive, revolver etc. Frequency: 30 kHz Search Head: 100x190 mm Tuning: Autotune Alarm on Detection: Audio/Visual Indicators: Unit on, Low Battery Power: Dry Battery Detection Capability: Pistol 15 cm, 1 Rupee Coin 2-3 cm. 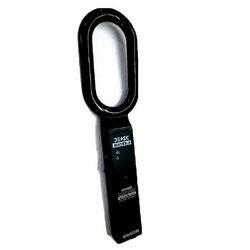 1-Most Popular Hand Held Metal Detector2-Uses Dry Cell3-Detects metals like gun, pistol, knive, revolver etc.